The derogatory term, 'Boong', originated from the name of the first recognised Aboriginal mediator to the colony—Boongare—of the 'Botany Bay' tribe. The sad reality is that 100 years post-Gallipoli, the term is still used in Australia as a racist term. Australia’s first nations people were among those who fought the conflicts of Imperial Britain on behalf of its King. The irony of this is that it was British invaders of the continent in the late 18th century who’d so callously introduced warfare by taking up arms upon Australia’s original occupants. Stories prevail about the lack of acknowledgement given to Black service people upon their return from the First World War to a nation that had itself been founded as part of colonial Britain.. Street parades and town square celebrations that marked the end of the War were not to include the ‘Boongs’. In fact, most Aboriginal soldiers were advised to keep what happened on the front, on the front. While camaraderie and equality existed among Australian soldiers overseas, back home, it was the opposite. This is why I've chosen to satirise the abhorrent treatment of Aboriginal return service people through a 'POP ART' style work that is both bold and poignant. 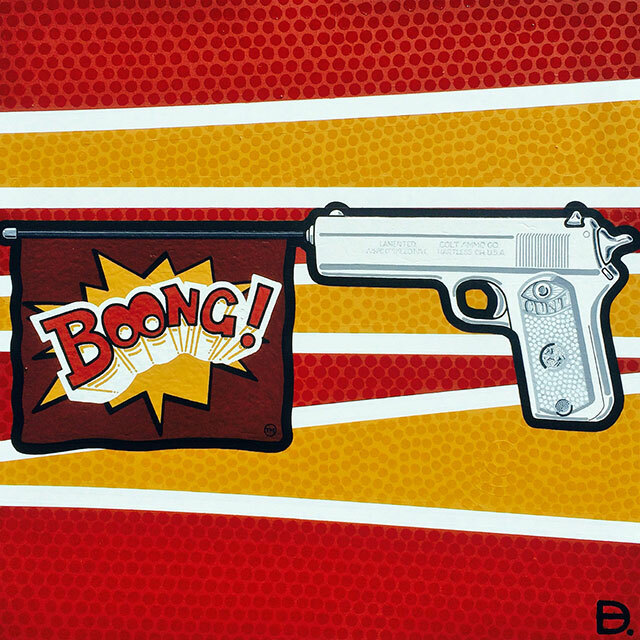 Having grown up with Looney Toons (cartoons) I distinctly recall the moment when the gun being pointed by one character at another would humorously ‘BANG’ a flag out of the barrel. Given that war monuments across Australia typically include canons or guns, I thought it apt to capture the phallic notions of this. My metaphor is this: whilst sentiment and nostalgia are celebrated annually through 'remembrance' events such as Anzac Day, there continues to be a denial of the frontier wars upon Aboriginal land. On top of this, I seek to draw attention to the maltreatment of the Blacks whom fought for 'our country'. ‘AUSTRALIANS’ ... you're really only shooting blanks.